We’re not 100% convinced that a new trade war is coming. There’s never a time when economists don’t see a trade war coming right around the corner and most of the time it doesn’t live up to the hype. But the talk is hot again. 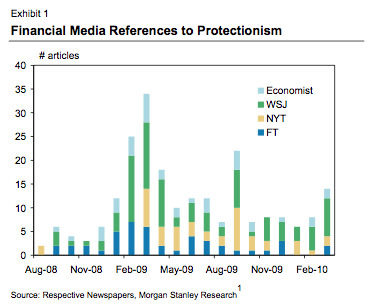 Here’s a nice little chart from Morgan Stanley analyst Emma Watson on media mentions of protectionism and trade wars, and as you can see the NYT, FT, WSJ, and Economist are all back at it. To some extent we can probably blame Krugman for this, since he’s on the China revaluation kick, though the Murdoch-owned WSJ remains king.